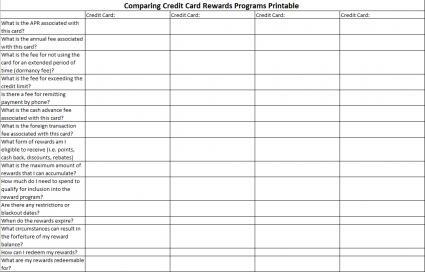 Download a rewards program comparison spreadsheet. A number of credit cards offer rewards programs. In most cases, points are redeemable for statement credits, cash back, gift cards, travel discounts and merchandise. Find the best card for you by comparing the rewards and other perks offered by these cards. Cash back reward programs issues cardholders rebates and cash back incentives when certain levels of card usage are reached. Point reward programs enable you to accumulate redeemable points when making purchases using the credit card. Gas reward programs help consumers save big at the pump through discounts on gas and cash back rebates. Travel and airline reward programs allow you to earn frequent flyer miles or rewards points for every purchase. They can be redeemed for travel vouchers and discounts. Merchant-specific (retail) reward programs offer extra points to cardholders for shopping with select retailers. There are several elements to credit card rewards programs that you should consider when conducting a search. Find the terms and conditions of each card you consider on their website or within any paperwork accompanying a paper application sent to you through the mail. The following list and corresponding spreadsheet will facilitate the process, making it easier for you to compare your options. To access the spreadsheet, simply click on the image. Fill in the information for each card you are considering and then compare them all the decide which card offers the best rewards with the most attractive terms. In exchange for the incentives offered to cardholders, products of this sort are typically accompanied by a higher APR and annual fee. Be sure that the benefits outweigh the costs to justify the high fees. On the other hand, if you do not plan to take advantage of the program, it may be in your best interest to select an alternate program or standard credit card product with lower interest rate. Once a certain threshold has been reached, whether in the form of points or cash back, some rewards programs restrict any further accumulation. This limits the redemption options available to you, regardless of the amount of expenditures. A popular feature of reward credit cards is the introductory offer of a specified amount of cash back or points when opening a new account. If you read the fine print, it often indicates that a certain spending level must be met within a specified period of time to qualify for participation in the program. Travel rewards are a great way to reduce vacation expenditures, but may come with stipulations. Some credit cards indicate that reward points can only be used during specified time frames, which can be a major inconvenience to the traveler. While some rewards are valid for the life of the account, others have expiration dates and do not rollover. Remitting payments after the specified due date may result in the forfeiture (or cancelation) of any points that you have accumulated. Closing accounts may also have this effect. Depending on the credit card rewards program, redemption options vary. Determine if the program is flexible or more restricted. In order to truly benefit from any credit card rewards program, it is necessary to spend money before you can reap the benefits. It is important to manage your expenditures wisely, and avoid racking up debt simply to receive perks. Also, avoid following consumer trends and instead only select cards that you will benefit from, based on potential savings, regardless of the incentives. Before selecting a rewards program that fits your needs, be sure to carefully review the terms and conditions of the credit card offer.